eApps Review 2019: Is eApps a Good Hosting? Founded in 1986, eApps provides reliable and secure Cloud hosting for mission-critical apps and websites. The company serves thousands of customers in over 125 countries worldwide. eApps offers private servers and Cloud environment with advanced configuration capabilities all built and managed by their experienced IT staff. Running on Enterprise-grade servers, their VPS and Cloud solutions are designed for speed, performance, and reliability. Windows and Linux servers run on the True Cloud Platform, a secure Cloud hosting environment with advanced capabilities for self-service. With their plans, you also get free setup and deployment, DDoS protection, Site Accelerator courtesy of StackPath in addition to uptime and resource monitoring. Their support team will also take care of minor software updates and fix server issues at no extra cost. Every certificate that you buy directly from them entitles you to a free SSL installation. Cloud hosting services provided by eAPPs employ advanced Cloud technology and is available at a reasonable fee. With their plans, you get customizable resources such as RAM, bandwidth, and storage. Their plans are suitable for customers who are looking for servers with plenty of configurations. You can scale resources horizontally or vertically to meet your workloads or demand. Included in your package is a suite of popular apps and MySQL. So you can create a database-driven site using your templates that come with your preferred CMS. If you’re more concerned about performance or speed, the eApps Platform as a Service (PaaS) with Xeon CPUs, ultra-fast network devices, and 100% SSD disk storage might be just what you need. You will enjoy stability and high levels of performance with their platform The initial 10GB of SSD disk space is free. You can autoscale CPUs and RAM instantly. With a set of app servers, IDEs, and tools such as git, their hosting accounts lets you develop and deploy PHP Java, Ruby on Rail, and Node.js apps fast. Starting with their risk-free Private Virtual Cloud Servers, you get a good number of configurations with either Linux or Windows OS. Their Create-A-Cloud tool lets you choose your zone, OS template RAM, number of CPUs, disk resources you need, and billing cycle. You have the freedom to scale your computing resources immediately depending on your needs. Load balancing, backups, and security services are included in every package. Six plans are available under their virtual cloud. Their Entry plan comes with 1 core, 512MB RAM and 8GB storage that can host standard HTML and PHP websites and a few email boxes. If you’re building a small CMS site on WordPress or Drupal, the Basic plan with 1 core, 1GB RAM, and 15GB storage will suffice. In my opinion, the best package for Java sites, apps, or medium-sized CMS with a couple of mailboxes is their Advanced plan that comes with two cores, 2GB RAM, and 25GB storage. Next is the Premium plan with four cores, 4GB RAM, and 75GB disk storage. This plan is a good choice for anyone who wants to host large CMS or Java websites, or resource-intensive apps including mail services for a medium-sized office. The last package is the Enterprise plan, which is suitable for traffic-heavy sites and offices with numerous email boxes. With it, you get 8 cores, 8GB RAM, and 150GB storage. eApps gives you a user-friendly space to construct and optimize your hosting resources. They have a range of popular hosting control panels that are intuitive and secure. You can choose cPanel/WHM, Plesk, or the low resource usage ISP. Each control panel lets you administer your websites, apps, web-based mail services, and perform system administrative tasks. You will also get access to app templates for Joomla, Drupal, WordPress, DBs, Tomcat, WildFly among others. eApps has customizable hosting plans with flexible and predictable recurring billing based on resource allocation. With their PaaS pricing model, you will never pay for buffer resources but only for the disk space, RAM, and backups that you request. With each deployment, you get traffic and disk space allowance at no extra cost. Resources are scaled up automatically to meet your growing needs. So at every billing cycle, you can expect to pay only for the resources that you use. Take advantage of the 14-day free trial to test the service. eApps also offers enterprise-level add-ons from trusted vendors. You can get the premium Zimbra email, R1Soft backups that ensure you never lose your files, and a CDN to speed up your website. Unlike some hosting services I have used, eApps provides outstanding personalized services including priority support to demanding customers. Their support team has friendly, competent, and responsive technicians who really care about resolving customers’ issues. They can help you install and configure software, modules, and plug-ins. Don’t hesitate to contact them if you need help to deploy enterprise app or fix a troublesome server. You can reach them by phone (UK and US), Skype, chat, email, or send a ticket 24/7. If you’re a hands-on person, you can access their Support Center to learn how to manage your web space effectively. They have a knowledge base with user guides, videos, and FAQs that cover website migration, setup, database management, emails, and security. 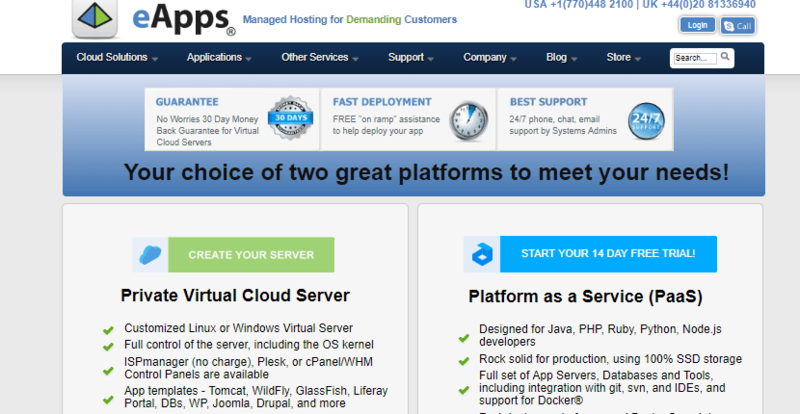 eApps is a great choice for demanding customers who are looking for private servers or Cloud hosting for mission-critical applications and websites. From support to features and pricing, everything is on point. Wondering how eApps stacks up against other Web Hosting companies? Enter any other Web Hosting company and we will give you a side-by-side comparison.